Home » Beer Reviews » Ales » Summer Ale – Shipyard Brewing Co. Some fruit and bready wheat in the nose but very soft. Definitely noticed a diacetyl buttery smell that overwhelmed the other scents that may have been there. The buttery smell isn't offensive but certainly seems like an odd smell for a summer style ale. Not exactly a "refreshing" smelling beer. Appearance: The color is crystal clear bright gold, looking only a slightly bit darker then an average macro beer. Head was an easy two fingers but dissipated quickly turning leaving only a thin film. Not much lacing to speak of. Smell: Some nice smelling fruit and bready wheat in the nose but very soft. Definitely noticed a diacetyl buttery smell that overwhelmed the other scents that may have been there. The buttery smell isn’t offensive but certainly seems like an odd smell for a summer style ale. Initial Taste: Flavor seems to start off pretty crisp and refreshing with hop-like cleanliness leading the palate followed by a sweet bready malt. This however become overshadowed by a tangy sourness that doesn’t really seem to go away. There are some light citrus flavors that try to make themselves apparent but overall seem to fall short. The finish is dull and somewhat dry. Thoughts: For me summer ales should have a refreshing quality not found in your other seasonal offerings. They are meant to be enjoyed in the blistering heat of summer. Usually summer ales are either pilsners or some variation of a pale ale which both offer lots of hops and clean tasting flavors with and light and crisp mouthfeel. Sadly I feel this particular selection doesn’t deliver as well as the other summer ales you can find on the shelves. While this is not an entirely bad beer it just doesn’t stand up against the competition. The flavor is just a little to buttery and sour to be considered a “refreshing” beer. But as usual don’t just take my word for it, try this beer yourself and see what you think. Who knows, this may become one of your favorites. Cheers. Looking back, its been about 2 years since I’ve tried this beer and like you I didn’t find it to be all that impressive especially considering all the other tasty summer ales available. I think I gave it one star out of 5! Sounds like I’ll be passing on this summer ale. Thanks for the warning! I hate to be negative about any beer I review but this one just did not do it for me. There was something in the flavor that I can’t quite put my finger one. “Tangy” and “Sour” are they only two adjectives that came to mind lol. Maybe they’ve changed things for this year, since the website says the brew is only 4.8 ABV now, but you’ve quoted 5.1 above… I guess “tangy” and “sour” could be good or bad, depending on the degree and one’s expectations… maybe this season’s is more subtle – because I only found it about as sour and tangy as apple juice (of course it didn’t have any sweetness of aj)… it seemed somewhat effervesent as well, which helped make it refreshing. Maybe worth another try for you? Thanks for the comment Madzi. I’m not sue where I found the ABV that said 5.1…possible it was from another site. I changed it though to reflect the correct ABV. Thanks for the heads up. In answer to your question, I will absolutely certainly give this beer another shot. Cheers! I vacationed the east coast last summer – Boston to Portland. 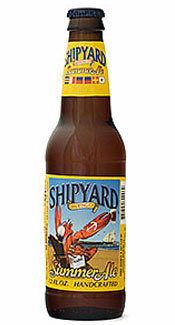 Legal Seafood, Portland Lobster Co., Funspot, Hampton Beach, F1 Racing, Bull and Finch – every place had Shipyard Summer Ale (well, not F1 Racing) and I LOVED IT! Miller High Life is my sit at home beer, and I found the Summer Ale flavor to be a Miller High Life with a slight flavor kick! A nice amber flavor with a hint of after taste. It cost me about $20 a six pack to have it shipped to a store here in Wisconsin when I got back (Shipyard hasn’t reached the beer capital yet – waaaaahhhh!?!?) But well worth it as an occasional “I deserve it”! !